MH&T on Facebook! - MH&T on Instagram! 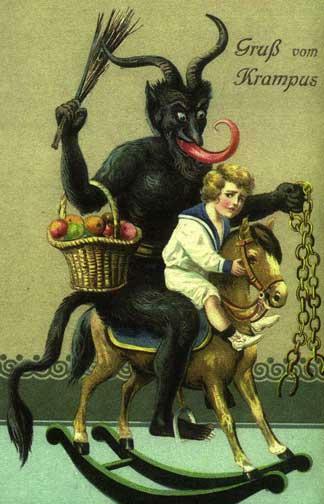 A "Greetings From Krampus" card, dating from around 1900. Way to ruin the fun, huh? Note that Krampus has also brought treats, in case he finds a good kid... no need for St. Nicholas around here! This image comes from the Wikimedia Commons website [Link Here]. PLEASE NOTE: Monsters Here & There was created by Garth Haslam, and should not be copied in any format without his express permission. If you use Monsters Here & There for research, please be sure to list Monsters Here & There and it's URL -- http://MonstersHereThere.com -- in your references. This site is copyright (c)2008-2019 Garth Haslam, all rights reserved. Web page design, logo/link art by Garth Haslam, 2015; he can be emailed by Clicking Here.